I had recently returned from my pilgrimage to the Holy Land. Many of the shrines we visited required some form of contortionism – you had to literally bend down to avoid hitting your head while going through portals that were better suited for hobbits. The problem is that in our excitement to look upwards, we often failed to look down. There is not only the risk of hitting your head on a low ceiling but also missing a step on an uneven floor. It does seem that life is often made up of a series of choices where you either have to choose to look up or to look down? Christians are often accused of having their heads in the clouds, for looking upwards without having any care for what is below. On the other hand, many people live as if there is no life after death. They believe that everything must find a final resolution or closure within this life. They search to better their lives by looking for or constructing an earthly Shangri-la or Utopia here below. People’s reaction to the result of yesterday’s general elections may fall into either one of these categories. To the first category, the general elections were met with indifference but to the second, the general elections meant everything. To the losers, it felt like the end of the world. This is a far cry from the message of the Feast which we celebrate today. The Ascension does not lead us to focus only on heavenly existence whilst ignoring earthly life. We need to look upwards, but we must never forgot to look down too. “Why are you standing here looking up into the sky,” was the question posed by the two men who were presumably angels. Perhaps, the disciples were stunned in disbelief, a kind of denial that Jesus had actually departed. In any event, the angels’ caution was a reminder that the disciples’ sky-gazing activities should not distract or detract them from their mission. On the other hand, whilst being committed to their mission on earth, they should also not lose sight of the eschatological event – that Jesus will one day return. In other words, we should not only look at what is immediately before us, but also ahead of us. Within this single scene, we can come to the conclusion that Christianity brings together both ethical obligations and missionary responsibilities that are tied to our existence here on earth as well as at the End Times. In the early decades of Christianity, many Christians sincerely believed that the world was going to end with the return of Christ in their lifetime. This led to an entire spectrum, a variety of lifestyles and behaviour. Some stopped working for they thought that their days were numbered and should therefore be better spent in prayer and vigilance for the Lord’s imminent coming. This resulted in economic crises in families. There were others who felt that since the world was coming to an end, it would therefore be best to spend the remainder of our lives in purely hedonistic activities – debauchery, drinking, partying and fulfilling every particular need of the flesh. In many of Paul’s letters, we see him frantically trying to correct this misunderstanding on the part of Christians and to remind them that their new life in Christ and in the Spirit had serious moral implications. In any event, they should continue their daily business and apply themselves to the missionary responsibility and commitment to the community. Although we are asked to proclaim the Kingdom of God through our words and actions here and now, we must not deceive ourselves by thinking that we can replicate heaven on earth. We must not confuse our present temporary existence with the eternal life promised by Christ to His believers. In the early age of Christianity, some Christians also grew impatient in waiting for Christ’s second coming. They felt weighed down by the trials and tribulations of their lives. They faced persecution from outside the church and conflict within the church. They were beginning to lose faith in God because they had lost hope in Christ returning to save them. In the face of such difficulties, we often find ourselves being blinded by our fears and anxieties, by the weight of present sufferings and trials. We are unable to see the light of God’s final act of redeeming humanity and recreating the world. Short term and seemingly achievable goals that provide temporary relief replace long term ones that promise salvation. Our vision becomes narrowed to the point of spiritual myopia. This was the problem of the disciples in today’s first reading. When they asked Jesus whether the time had come for the restoration of the kingdom of Israel, their focus was only on building an earthly kingdom, a kingdom confined to their ethnic identity. 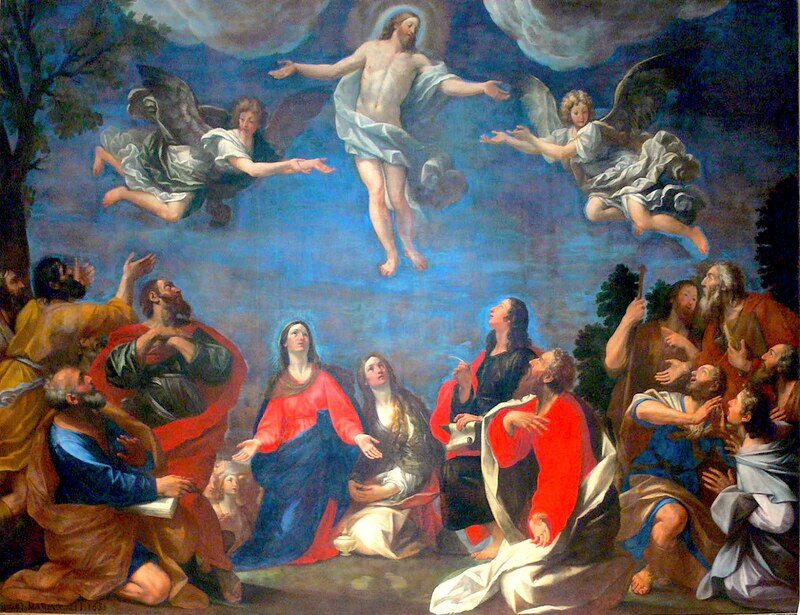 But the event of the Ascension leads them to understand that the kingdom of God is much broader than any vision of an earthly paradise that could be achieved in this life or even in the future to come. The kingdom of God would only come to its perfection at the end of time, when God recreates the whole of the universe in Jesus Christ. This, however, does not release us from our present responsibilities but rather challenges us to constantly work for the Kingdom of God throughout our earthly lives. We will never be able to create a perfect society in our lifetime, therefore the need to always work for the betterment of society, the healing of relationships and the promotion of justice, love and peace in this world. Keeping our gaze on the bigger picture, on the Kingdom of God, allows us to rise above any setbacks, failures and disappointments. We are only able to see a small part of the picture. Our personal failure is not to be translated as ultimate failure which would be disastrous. In fact, our faith and hope informs us that our victory is already assured. The Ascension is our assurance of this. Today, as we reflect on this feast of the Ascension, let us not look into the sky and be lost in the clouds like the disciples in today’s first reading. Rather, let us recommit ourselves to the mission which Christ has entrusted to us, here and now. But, let us also not be too concerned with our human pursuits that we lose sight of God’s kingdom and Christ coming at the end of time, for then, we will only substitute the promise of heaven with a poor imitation here below.